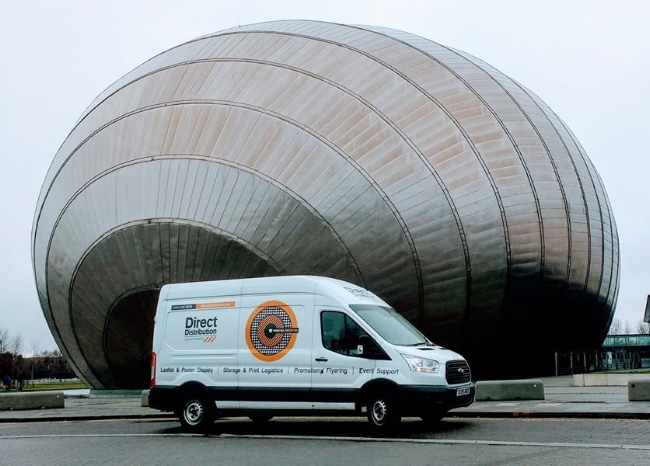 Direct Distribution provides their full range of services throughout the whole of Scotland. We provide access to over 5,000 outlets to display your print, street teams and event support staff. Direct Distribution can target the rest of the UK with our partners, giving you broader coverage - and we'll manage the process. The geographic reach of our merchandisers ensure that we deliver maximum exposure, maximum pick-up and minimum waste throughout distribution points. Get in touch with us and find out how we can help you target, distribute and even manage your marketing stock. 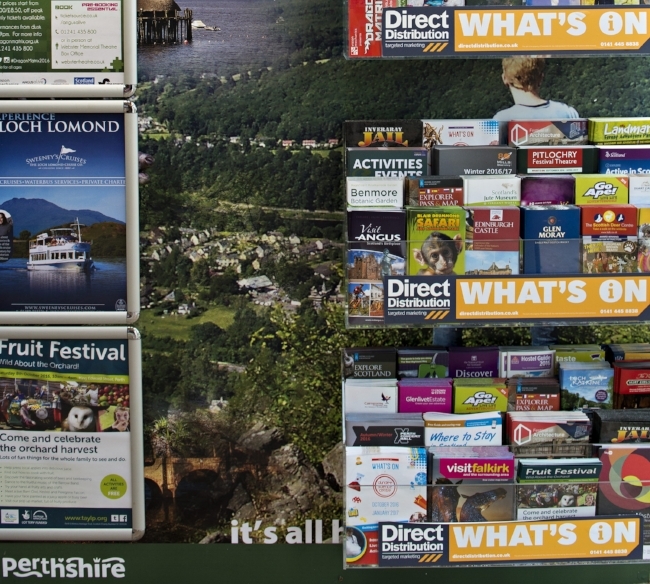 Direct Distribution is best known for thousands of racks & poster frames across Scotland displaying your print in prominent, attention grabbing locations. Experienced street teams provide promo hand-2-hand services throughout Scotland, getting your print directly into the hands of the audiences and your targets. We provide a unique service in Scotland to support your events and do the legwork to make sure that your event stands out and runs smoothly. providing leaflets in the correct places makes it possible to influence what activities visitors undertake during their holiday. Contact our accounts team to find out how we can support you. • 76% of visitors pick up leaflets from a rack. • 34% planned to extend their stay. Target your print to our extensive portfolio of over 5,000 outlets. These include: railway stations, motorway stops, ferry terminals, bus stations; city tour buses; shopping centres and supermarkets; attractions, heritage & visitor centres (eg. Edinburgh Castle); cultural, arts & theatre outlets (eg. Edinburgh Filmhouse); leisure centres; the Scottish Exhibition and Conference Centre; libraries; visitor information centres; hotels; caravan and camping sites; guesthouses & BB's; eat & drink outlets; bars & cafes; universities & colleges. Tell us the market you wish to reach - this could include families, arts & cultural attendees, commuters, high-spenders, clubbers, the youth market and students, tourists, LGBT, suburban residential and much, much more. Direct Distribution target outlets right across Scotland from Glasgow and Edinburgh through to the Borders, Argyll and Aberdeen. Using your customer & market knowledge you may want to concentrate on specific geographical areas or within a specific drive time. We can select outlets in any region or area you designate to ensure they are covered. We also have partners we work with throughout the UK. Can't find what you’re looking for? Tell us what you need – whether it's a neighbourhood drop in Pitlochry, business commuters with a healthy bank balance or a rock enthusiast in Scotland's furthest reaches - we'll find them. "We have been using Direct Distribution for our events management for years. They always seem to know exactly what we need and arecompletely efficient – the first ones onsite and the last to leave." "At Calmac, we have worked with Direct Distribution (DD) for more than 10 years. In that time, our distribution requirements have changed substantially, from deliveries of the Calmac timetable to our own ports in 2001, to a complex matrix of publications which today are delivered to a large number of targeted sites around the UK and overseas. 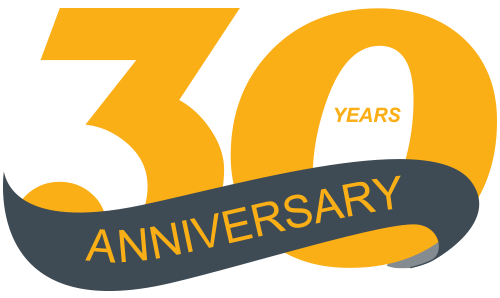 ..As our requirements have changed, the staff at Direct Distribution has worked with us to ensure our needs are met on every occasion. An efficient distribution service is essential to any business, and I would not hesitate to recommend DD." "It's their reliability that we most value – the team are unflappable when any unforeseen issues arise and are extremely professional from start to finish." Can We Hire Direct Distribution? Of course you can. Partner with us and get access to our network of prominent display systems, utilise our engaging hand-to-hand teams or have our fleet team mange your inter-city branding and infrastructure display projects.